Esophagus is the tube that connects mouth to the stomach. This tube helps the food move from the mouth into the throat and down to the stomach to be digested. Esophageal cancer is malignant tumor that occurs in the esophagus. This can happen anywhere along the tube, though it is generally concentrated on the lower part of the esophagus. It usually begins with the cells that are lined in the esophagus. Esophageal cancer can be classified as adenocarcinoma and squamous cell carcinoma. The cells in the esophagus develop mutations in their DNA and divide way out of control. The abnormal, accumulated cells grow into a tumor and infiltrate structures close to it and spread into the body. Squamous cell carcinoma: Squamous cell carcinoma is associated with drinking excessive amounts of alcohol and excessive smoking. Squamous cells are thin and flat lining the surface of the esophagus. It often occurs in the middle of the esophagus. Adenocarcinoma: Adenocarcinoma is common and associated with GERD – gastroesophageal reflux disease which can result in Barrett esophagus conditions. It starts with the mucous-secreting glands lodged in the esophagus. Other: There are other rare types of cancer that may occur in the esophagus such as lymphoma, melanoma, sarcoma, choriocarcinoma and small cell cancer. Difficulty in swallowing: Dysphagia is a very common symptom of esophageal cancer. It feels as if food is stuck in the throat or chest. It starts mildly but later intensifies. If cancer is severe ,swallowing of even liquids become difficult to. Chest Pain: Individuals experience pain and discomfort in the middle of the chest which is not related to eating or swallowing. Regurgitation: Reverse movement of food is through the esophagus is experienced without being able to swallow food completely. Weight loss: Fifty percent of the people lose weight progressively. This is due to inability to swallow food. Biopsy: Cells and tissues from the esophagus is taken and examined under a microscope for cancer. 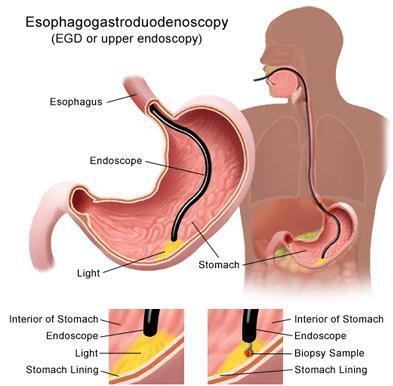 Endoscopy: A thin tube called an endoscope is passed down the throat. An endoscopic ultrasound apparatus attached to its tip utilizes sound waves to give more information about the tumor. Doctor here provides best Esophagus Cancer Treatment in India.